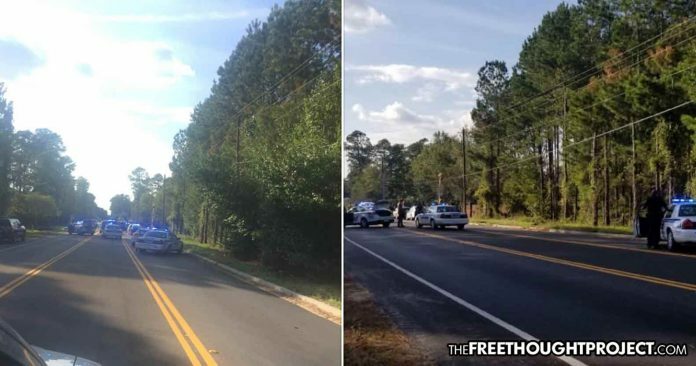 Florence, SC — On Wednesday afternoon, two city police officers and three sheriff’s deputies were shot by an active shooter in Florence, South Carolina. Around 5 p.m. local time, the Florence County Emergency Management Dispatch put out the following statement warning residents of an active shooter situation. According to reports, the active shooter emergency was declared just before 5 pm local time, and the authorities reported the capture of the suspect about an hour later. The nearby West Florence High School was locked down as a precaution. Moments ago, police confirmed that the shooter was in custody and the situation is under control. They urged anyone in the area to stay clear. “The active shooting situation is over and the suspect is in custody. We are asking everyone to stay away from Vintage Place as there is still an active crime investigation in progress,” the statement read. Chief Deputy Glen Kirby with the Florence County Sheriff’s Office told local news outlets that three Florence County deputies and two Florence city police officers were injured. However, no details on their condition have been released. ****Major Update****The active shooting situation is over and the suspect is in custody. We are asking everyone to stay away from Vintage Place as there is still an active crime investigation in progress. Details on the shooter have not yet been released. We will update this story as more information comes out.